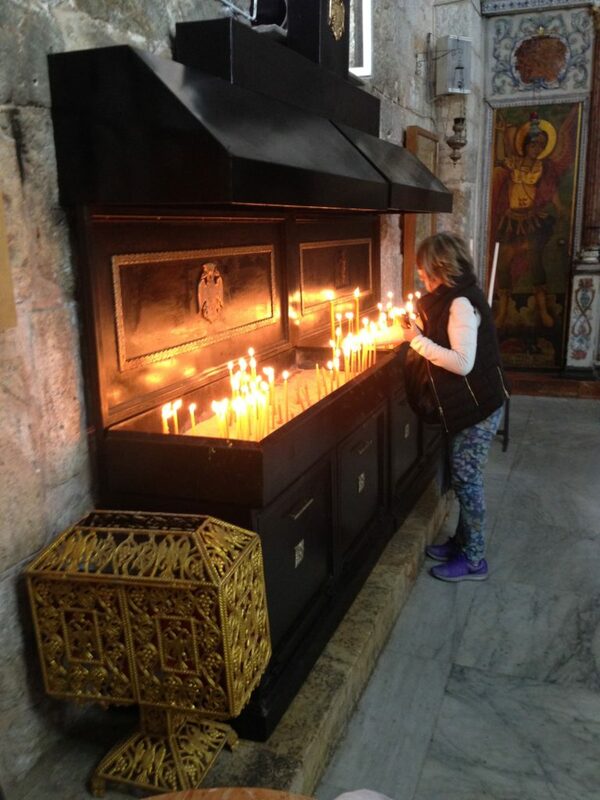 The formal reason for my trip to the Middle East was that I wanted to investigate the convergence of the veneration of St. George, the fourth-century Christian soldier and martyr, and that of al-Khidr, the revered Muslim wali. That these two figures have, at certain times and places, been identified with each other, despite the traditional animosity between Christianity and Islam, is remarkable. What is really going on? What are the terms of this convergence – does it even exist? 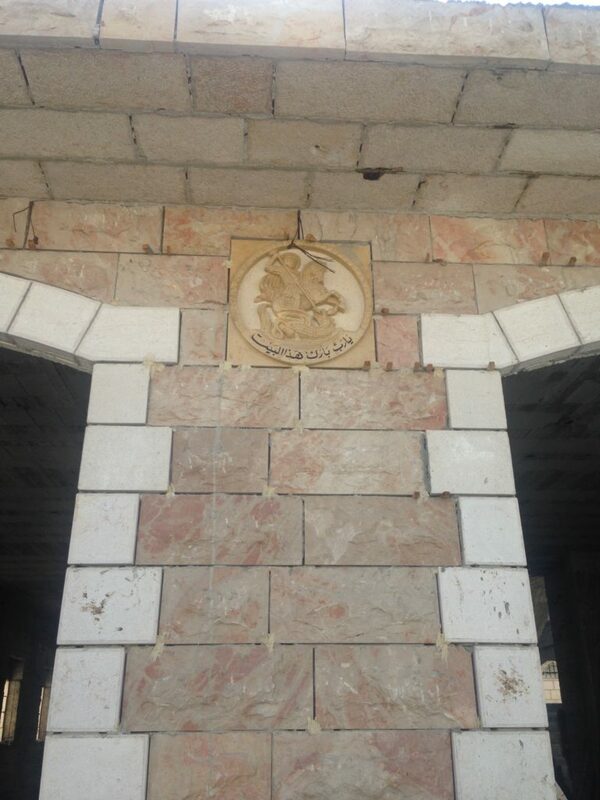 St. George is everywhere in the Middle East. 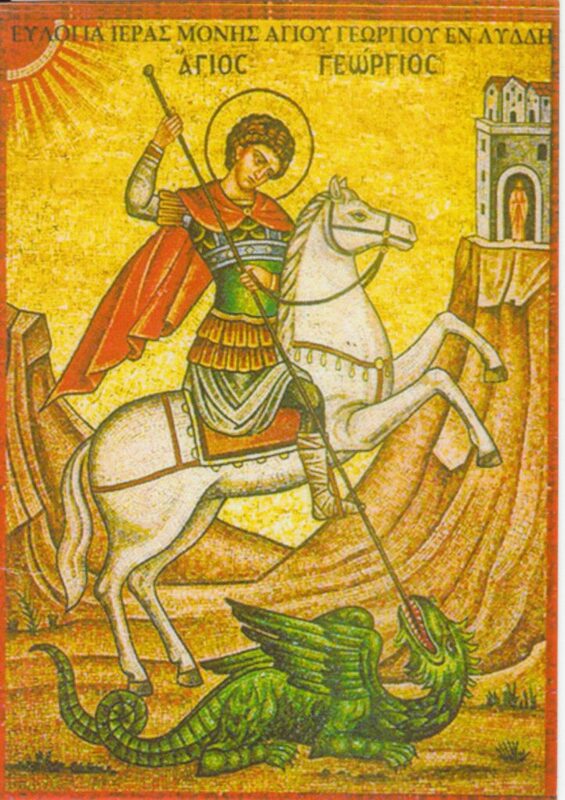 If there are Christian remains, you will find an image of St. George in them. If there is an active Christian community, there is a very good chance that one of its churches will be dedicated to St. George; whatever its dedication, there will certainly be many images of the saint, inside and outside the church building. He is not the only equestrian saint, nor the only military saint, nor even the only dragon slayer, and he was certainly not the only Christian to have been martyred under Diocletian. But somehow people love him the most. I think that one reason is because his dragon slaying is not just visually symbolic, but the illustration of a romantic story about how he rescued a damsel in distress. This sort of thing is always popular. Perhaps more importantly, he is considered a powerful intercessor and miracle worker, something always very important and useful. Khidr is a somewhat more obscure figure. Although not mentioned by name in the Koran, he is widely identified as the righteous servant of God in Sura 18, “The Cave,” and is charged with instructing Moses. Moses promises to learn humbly and not to question Khidr, but Khidr acts most inexplicably, and Moses cannot help himself. First Khidr bores a hole in the bottom of a boat belonging to some fishermen, then he kills a young boy, and finally he fixes a wall in a town, right after its inhabitants had refused to offer hospitality to him and Moses. With each of these incidents, Moses breaks his promise and expresses disappointed surprise, but Khidr then reveals his reasons: he damaged the boat just enough to prevent it being commandeered by a king, the boy was evil and Khidr killed him so that Allah might give his believing parents a better son, and he repaired the wall because beneath it was buried treasure belonging to two orphans, whose deceased father had been righteous and who would be in no position to defend it should its presence be revealed. The message is that God’s wisdom is beyond human understanding. Since there are very few Christians left in Turkey, there is no longer any question of convergence between St. George and Hızır. The Egyptian scene is somewhat different. Some ten percent of Egyptians are Christian, and the country does not have the same tradition of compulsory secularism that Turkey does – since 1980, Sunni Islam has been the state religion. Furthermore, Egyptian Muslims, perhaps because their own language descends from that of the Koran, seem to know the Koran better than Turks do. When I asked people about Khidr, most of them were able to relate the story from Sura 18, about Khidr’s three successive and seemingly inexplicable actions. When I asked whether Khidr helps people, and whether people offer some sort of thanks to him in return, they were surprised, almost offended. “That’s polytheism!”, one man exclaimed. “We only seek help from God.” Khidr is revered as other prophets are revered, but no one I spoke with admitted to seeking or receiving aid from any of them. “Khidr may have helped people long ago, but not now,” another man explained to me. Thus, despite a list of places allegedly sacred to Khidr that I had compiled from various sources, I could not find a single one that was currently and obviously designated as such. There were no inscriptions, or any people doing things to honor him. I confess I was somewhat disappointed. But speaking with Christians I heard a different story. 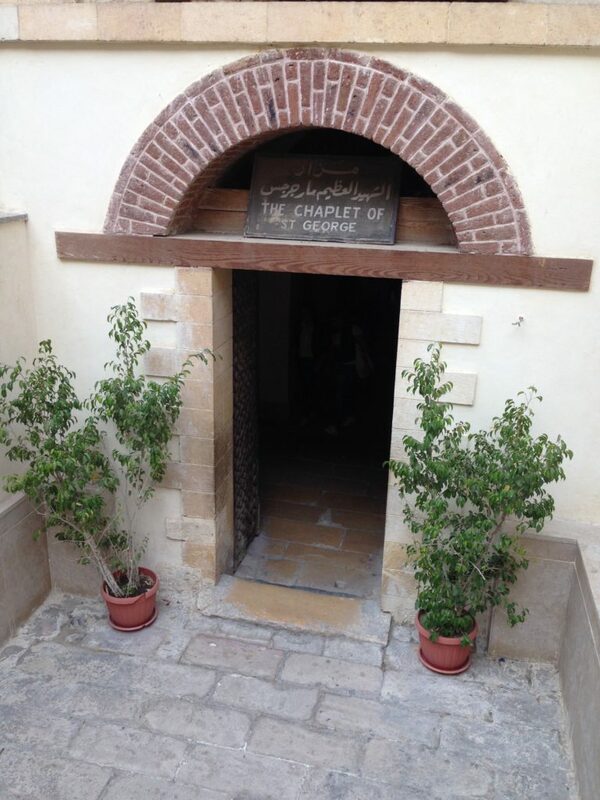 In Egypt, in Old Cairo, one finds two churches to St. George – in both places, the Christians claimed that local Muslims did indeed seek help from St. George, whom they called “Khidr.” A priest of the Greek Orthodox Monastery of St. George in Old Cairo said that Muslim women who want to become pregnant will visit the church, and that one can see little plaques in the church in Arabic left by Muslims in thanks for Khidr’s services (although I did not find these and the priest did not have time to show them to me). A sister of the nearby Coptic Convent of St. George said that Muslims will indeed come by – not all the Muslims in Cairo, by any means, but some of the locals from the area will pay the occasional visit to what is designated the convent’s “Chaplet of St. George.” I suppose it helps that certain actions are prescribed here: you can light a candle in front of an icon of St. George, you can touch a cloth roll containing his relics, or, most significant of all, you can be wrapped with the chains that bound him during his martyrdom. I had read about this custom, which dates back at least to the nineteenth century. Allegedly it cures madness or at least headaches, and I could not resist getting wrapped with them myself. In other words, these rituals make it easy for visitors, including any Muslims, to participate in the veneration of St. George. A similar situation prevails in the Palestinian Territories, where most of the Arabs are Sunni Muslim, but a minority of 1-2% is Christian. 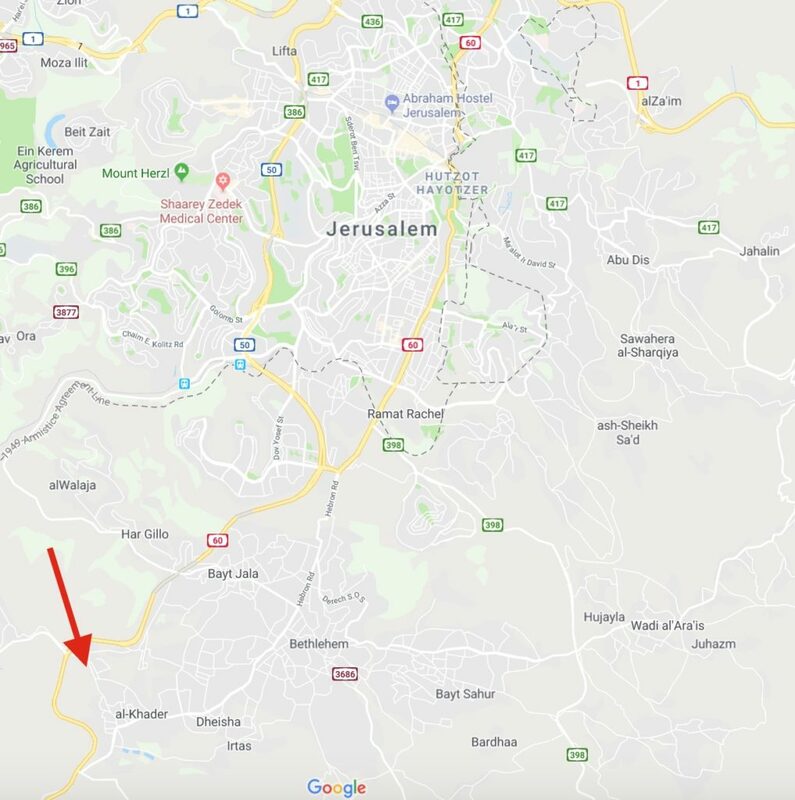 The town of Beit Jala, to the south of Jerusalem near Bethlehem, is predominantly Christian, and to the southwest of Beit Jala, in the otherwise Muslim town of al-Khader, is a Greek Orthodox monastery of St. George, complete with a small but handsome church dedicated to the saint. This church is famous in its way: William Dalrymple describes it in From the Holy Mountain (1994), and it once merited a subsection on the entry for St. George on Wikipedia (entitled “Interfaith Shrine,” although the current subsection on “Islamic tradition” does not mention it specifically). These writings, and others, mention that Muslims come there to pray and offer thanks to St. George, whom they call Khidr. (This would seem to be reflected in the name of the village itself.) 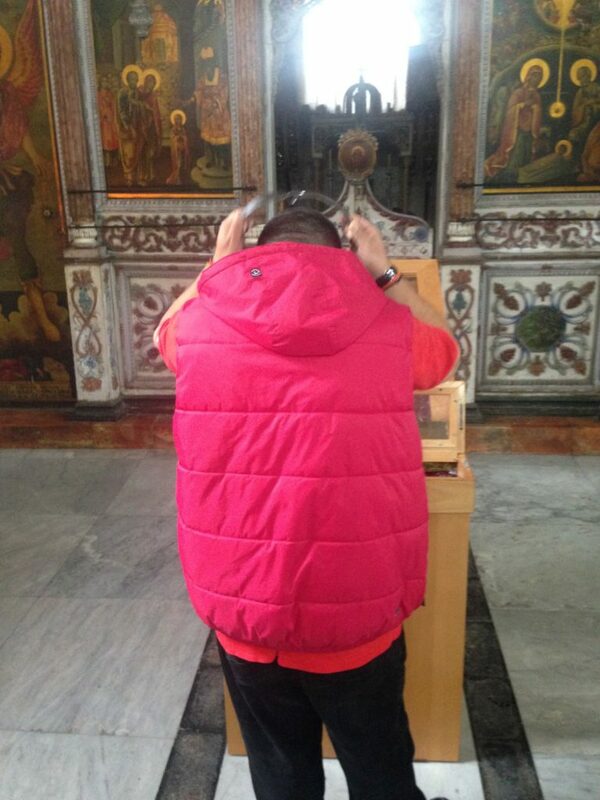 I did not get to speak with any of the brothers of the monastery, but I was shown the church by a man in charge of it. He could not speak English very well, although he answered my questions as best he could, and said that yes, Muslims do indeed come by. 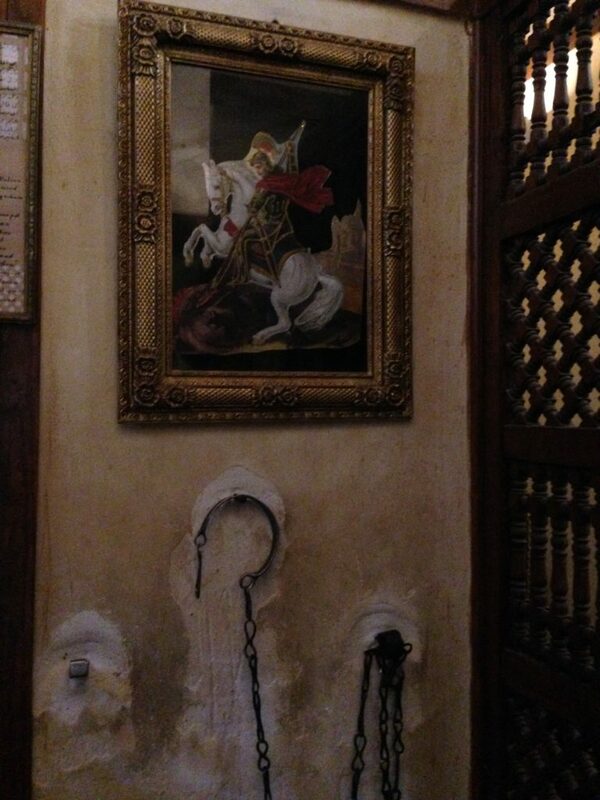 This church also featured a set of chains (he claimed these ones were the reins of St. George’s horse) in which he had me step through three times and enjoined me to kiss. Of course there were many icons of St. George throughout the church; the most important was a large one displayed behind glass. 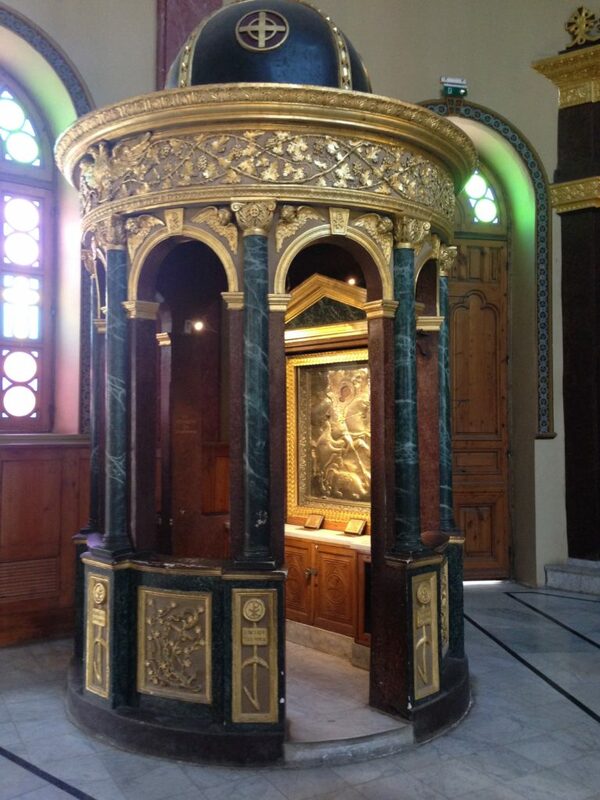 A three-inch gap existed between the icon and the glass, into which people had deposited petitions and offerings in thanks for prayers answered. 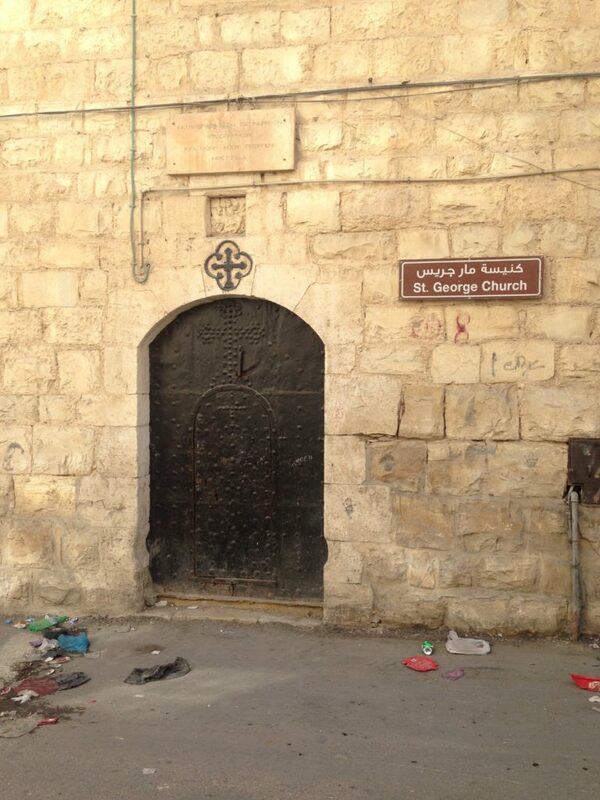 Clearly St. George was popular in the area – although I did not see any direct evidence that Muslims venerated him. The next day, in Beit Jala proper, I had a revealing conversation with a local Christian in the Greek Orthodox Church of St. Nicholas. The current church building dates from 1925, but the site is historic, since it contains a cave that once housed its namesake saint for four years before God called him back to Myra. In 1995, the church was proud to acquire one of the relics of St. Nicholas. Like St. George, St. Nicholas provides miracles: once an old man was commissioned to repair his icon frame, and his light stayed on even though the power had gone out in the city – and even though the light hadn’t been plugged in! “So do Muslims ever ask for miracles?” I asked. “Yes they do,” he replied, “but discreetly – for example, they might ask a Christian to light a candle for their sick son. And yes, in al-Khader, the locals protect the monastery, because they get miracles from St. George there – in fact, they see him riding around on his horse, and fear him.” “Protect?” I asked. “Yes, unfortunately,” he said, “without such local support, Muslim radicals would have destroyed the church long ago.” “But,” I said, “I read somewhere that Israeli oppression brings Palestinians together regardless of religion. Does this not happen here?” “It should,” he replied. “But unfortunately when people get radicalized they don’t think in terms of Israelis, but Jews, and Christians. When people get into the Bible, they withdraw from the world, but when they get into the Koran, they get more materialistic, and lust for power and control.” Obviously a certain sectarian bias might be at work here, but it would seem that, like in Egypt, participating in Christian ritual is something that many Muslims frown upon. 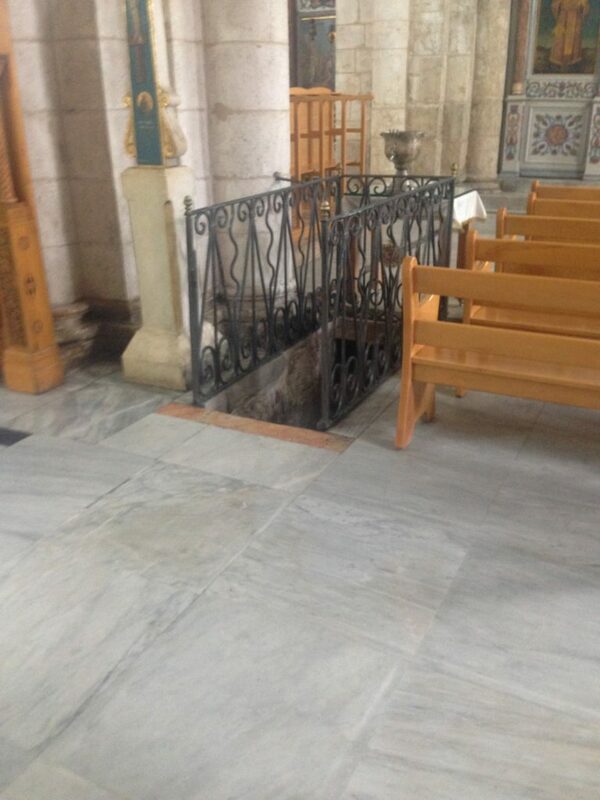 My final church of St. George contained his sarcophagus and is found in the Israeli town of Lod (a.k.a. Lydda), near Tel Aviv. This site has existed since antiquity, and it plays a role in the narrative of both the First and Third Crusades (in 1099 the crusaders returned some relics of St. George to Lydda that they had acquired in Antioch, and instituted a Latin bishopric there; in 1192 Richard the Lionhearted spent six weeks encamped outside the town and may have rebuilt its church, which had recently been destroyed by Saladin). The current building dates from the nineteenth century, and consists of a main nave with a slightly narrower nave to the left. 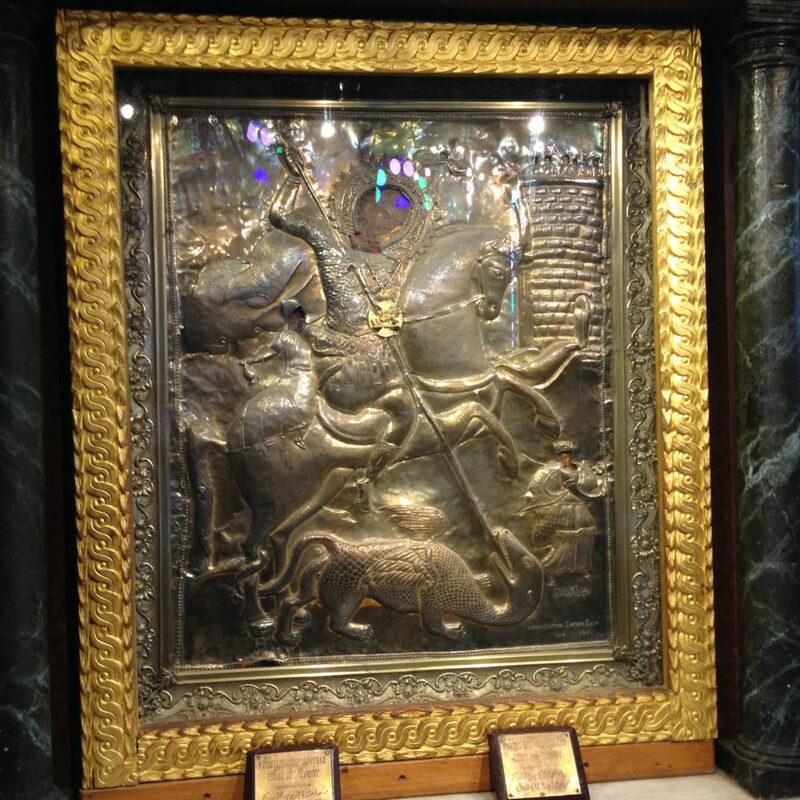 Throughout the church are various “stations” of St. George, including: a chain to wrap oneself in; a freestanding silver icon in an intricately carved wooden frame; a large icon on the iconostasis (that is, the screen separating the nave from the sanctuary, what in medieval England might have been called the rood screen); the actual tomb of St. George in the crypt; and, in front of the main iconostasis, a stand featuring an icon, some relics of St. George, and a wooden “chalice” holding a glass jar full of oil and a floating tea light (see the photos below). An interesting ritual took place at this stand while I was there: a group of Romanian pilgrims was visiting the church and, one by one, they approached the stand. There, a priest dipped a sort of stylus into the oil, and with it anointed the pilgrims on the forehead, cheeks, chin, and hands. Thus was the power of St. George bestowed on his votaries. 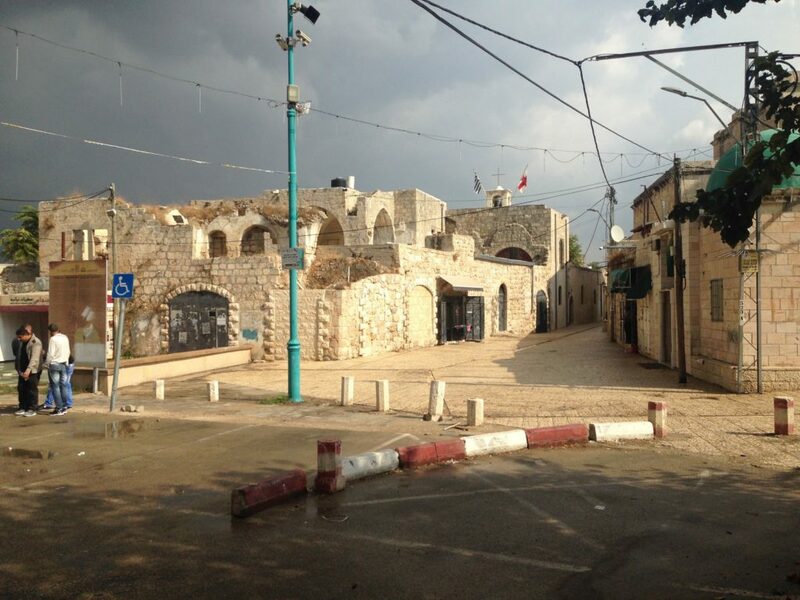 As in Beit Jala, I did manage to speak with a local Christian at this church, who claimed that Muslims have great respect for St. George and that they see him riding his horse around the neighborhood (Lod’s population is about 25% Arab, most of whom are Muslim). 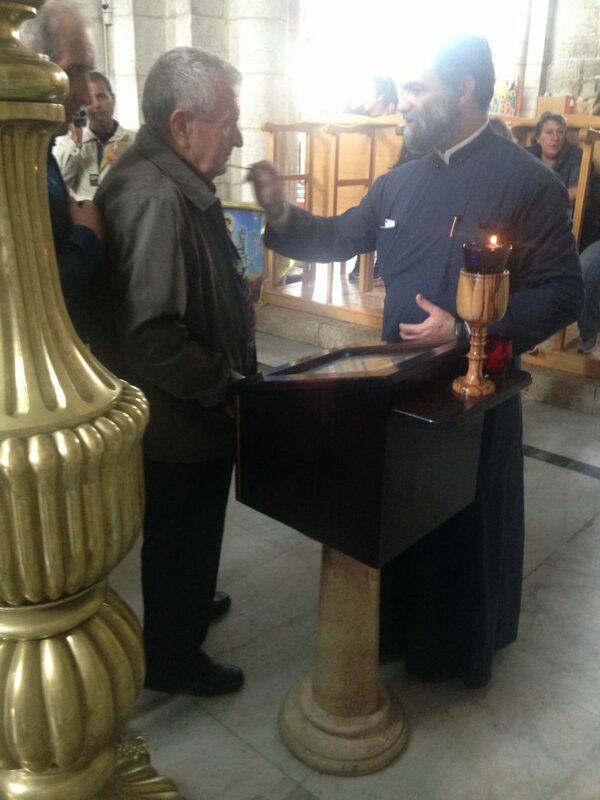 But the only evidence I saw here of any Muslim “participation” in the cult of St. George was a Muslim woman who entered the church, took off her shoes as though she were in a mosque, walked into the nave, looked briefly at the iconostasis, and then returned to the door, put her shoes back on, and departed. Given the multiple opportunities to honor the saint in his church in Lod, I can’t say that this seemed particularly meaningful. So what is going on, really? And whom should one believe? One can understand why Muslims, when asked, would categorically deny that any of them would stoop so low as to participate in Christian religious practice. But one can also understand why Christians would claim that Muslims would participate. What a feather in your cap, if your religion is attractive to others! I don’t think that the Christians were lying necessarily – exaggerating, maybe, but if only a handful of Muslims venerated St. George, their statements about Muslim worship would be true. One possible explanation, according to my Coptic Christian guide at Luxor, is that you can divide people in to three categories: The first are the poorest and least educated, who will do anything they think can help them, without thinking about it too much. The second are in the middle class and educated enough to take their Islam seriously. And the third are the elites, in education and socio-economic status, who don’t take anything religious too seriously. So by this schema, people who pay homage to St. George are uneducated, marginalized, and desperate for miracles, while most other people, i.e. the ones I spoke with, are well versed enough in Islam not to go in for such alternative medicine. This sounds about right. If nothing else, it certainly provides contemporary evidence that St. George remains a powerful miracle worker, as he has always been. Rather than trying to integrate images into the text, I have placed them in an appendix. (There are 68 images in total). 1. 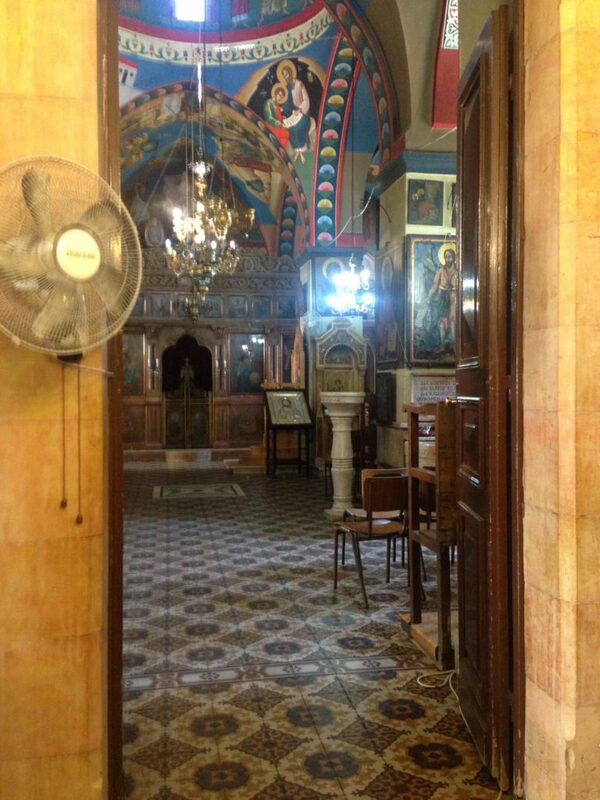 From St. George’s Greek Orthodox Church, Old Cairo. A sculpture that greets you as you climb the stairs to enter the church, indicating its patron saint. Inventive typography in a “Hagios Georgios” roundel. 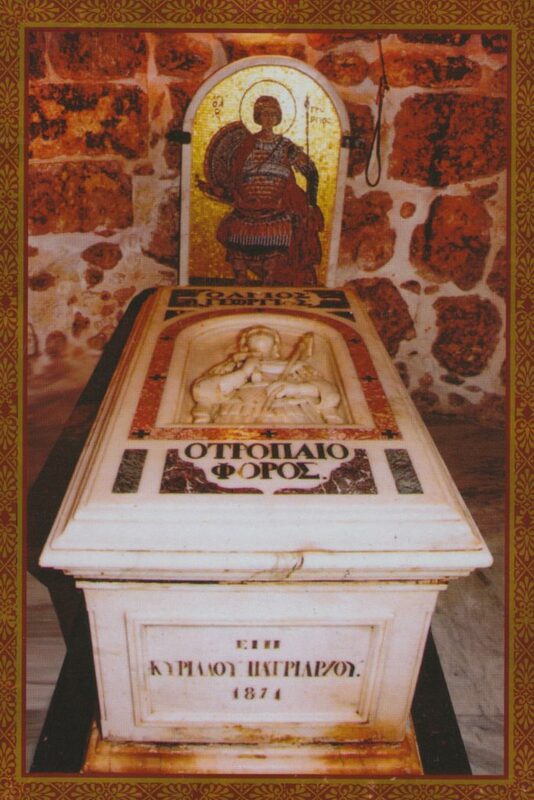 A shrine in the church, containing an icon of St. George. A close-up of the icon, entirely silver except for St. George’s face. In the same church: another icon, made entirely of silver, with offerings. 2. 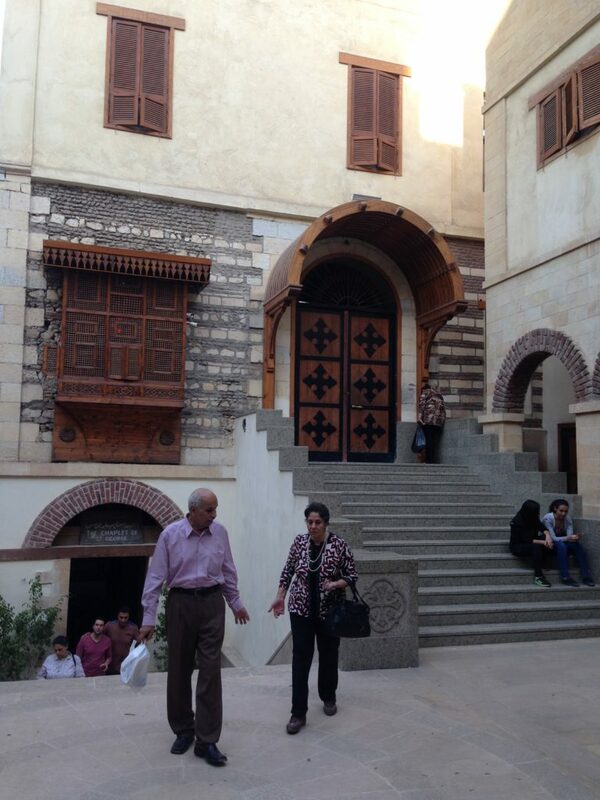 St. George’s Coptic Orthodox Convent, Old Cairo. The courtyard of the convent, with the exterior entrance to the Chaplet of St. George on the left. A closer view of the exterior entrance of the Chaplet of St. George. 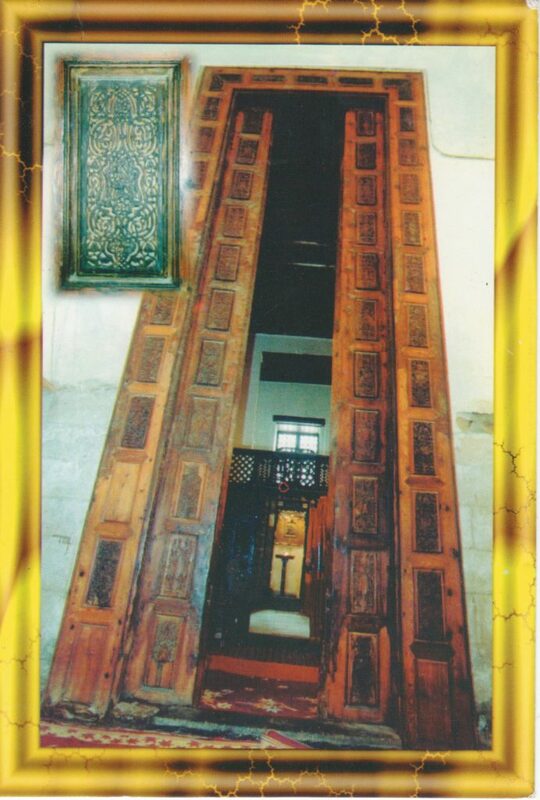 A scanned postcard, showing the interior entrance to the Chaplet of St. George and its seven-meter-high wooden doors. In the Chaplet, a Coptic icon of St. George, with velvet roll containing relics. Normally this roll is contained in the glass case beneath the icon, although it can be taken out and handled for devotional purposes, as it is here. 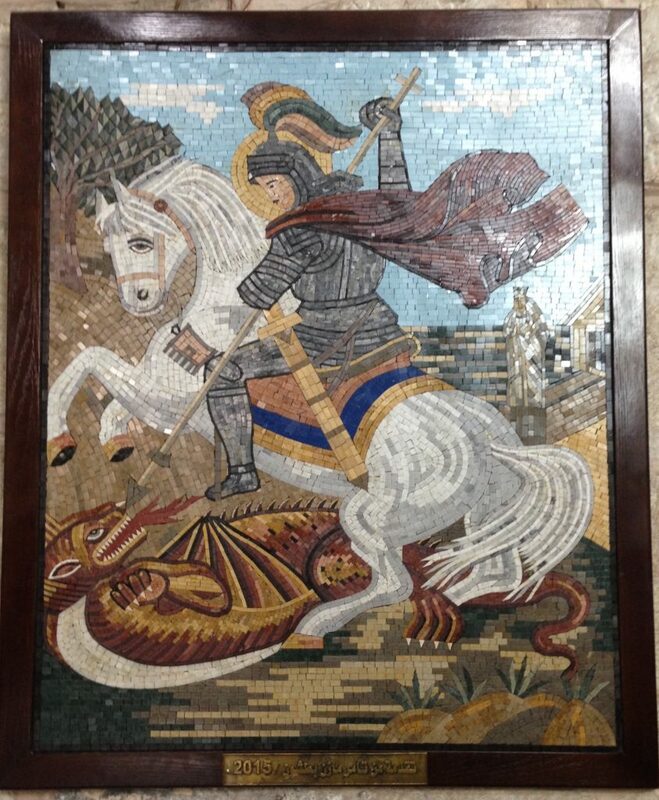 Elsewhere in the chaplet, a mosaic of St. George. Another mosaic of St. George, this one with a crown of martyrdom being presented by two angels. 3. 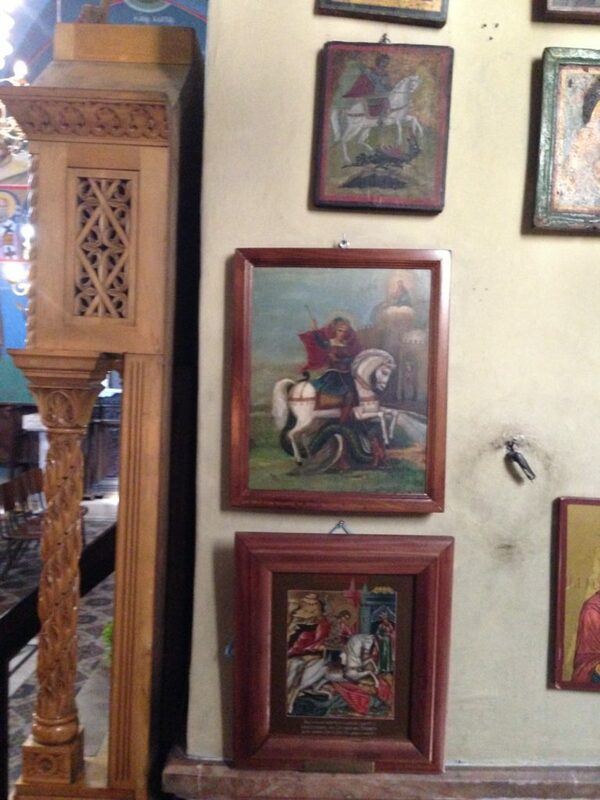 Various other Coptic icons of St. George. Note how many feature the pitcher-bearing youth riding with him, and Arabic script, indicating the everyday language of the Copts. 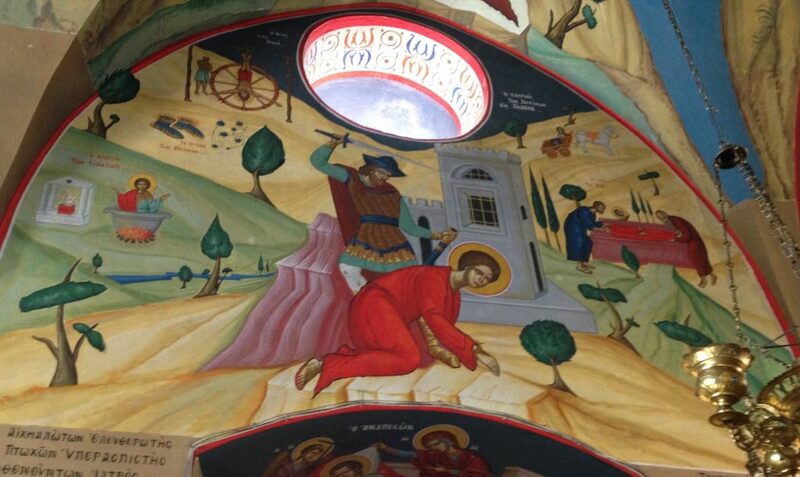 Icon of St. George, St. Shenouda’s Church, Old Cairo. 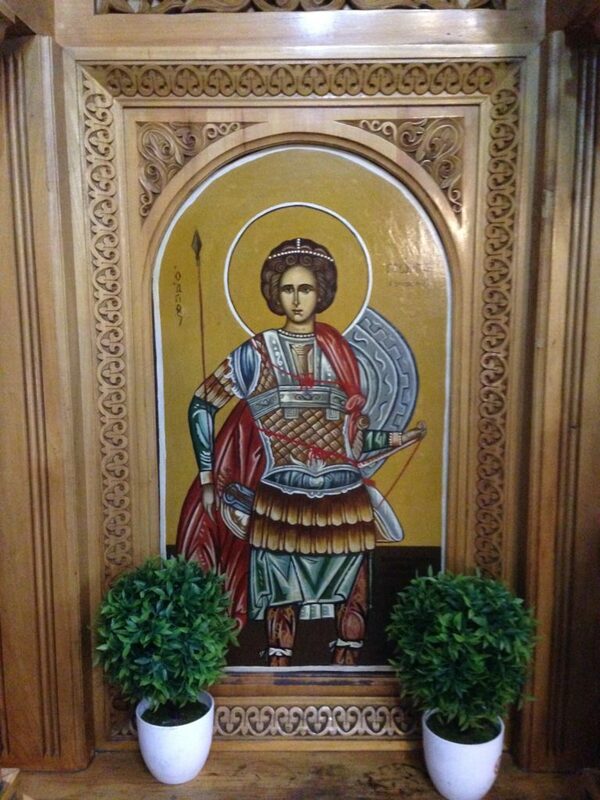 Icon of St. George, St. Shenouda’s Church, Old Cairo. I confess that I am unclear on who the stripped, bound figure near the dragon is supposed to represent. 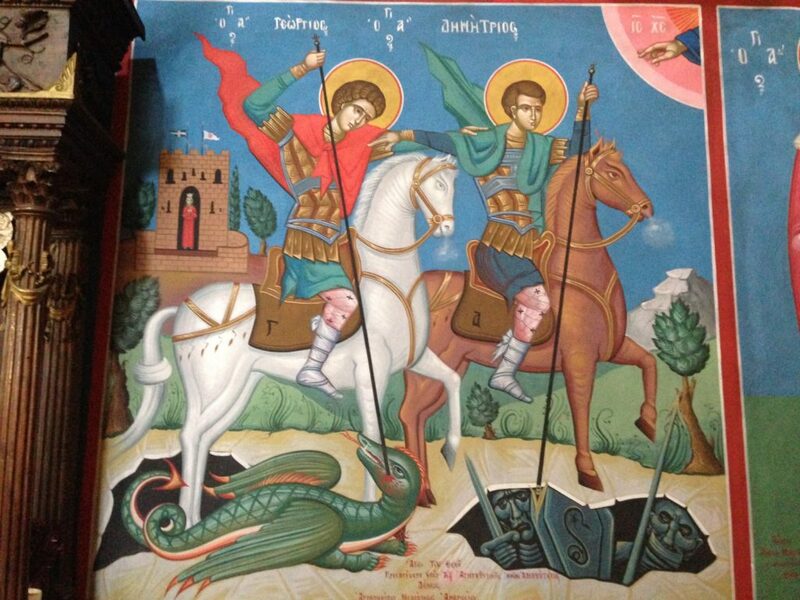 Icon of St. George, El Damshiria Church, Old Cairo. I like the appearance of the banner in this one. 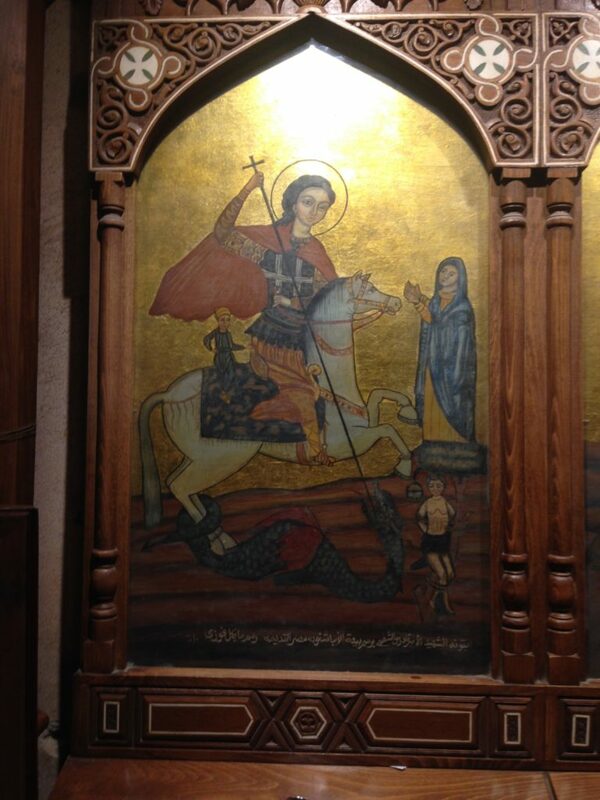 Icon of St. George, El Damshiria Church, Old Cairo. 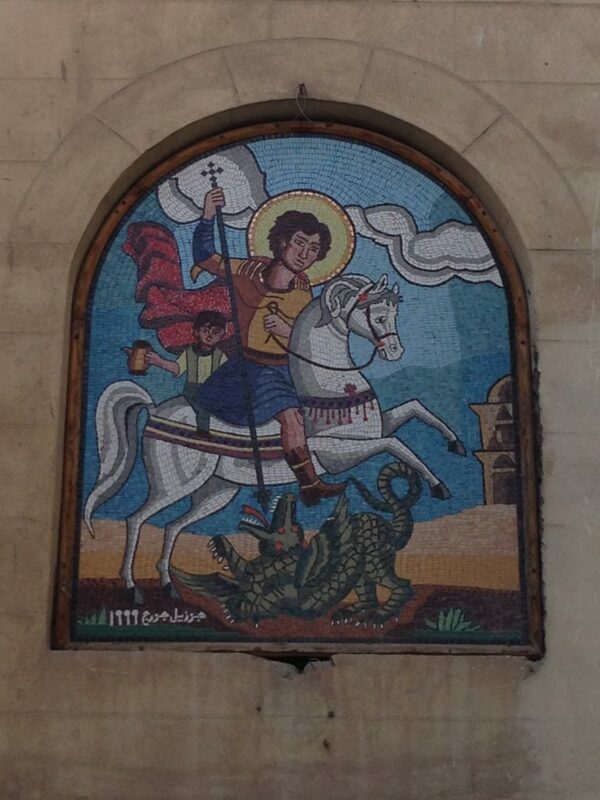 Icon of St. George, Abu Serga Church, Old Cairo. I like the brutalist castle. 4. 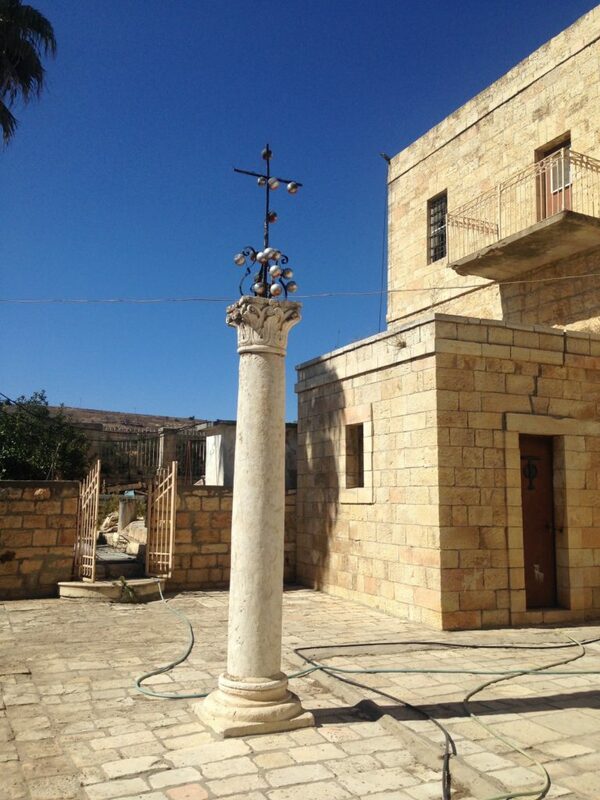 From St. George’s Greek Orthodox Church, Al-Khader, Palestinian Territories. Map showing location of St. George’s church and monastery, al-Khader, in relation to Beit Jala, Bethlehem, and Jerusalem. Google Maps. The main entrance to the monastery. A view of the exterior of the church from the courtyard, and a minaret from the mosque across the street. The church as one enters it. A view of the church’s decoration. 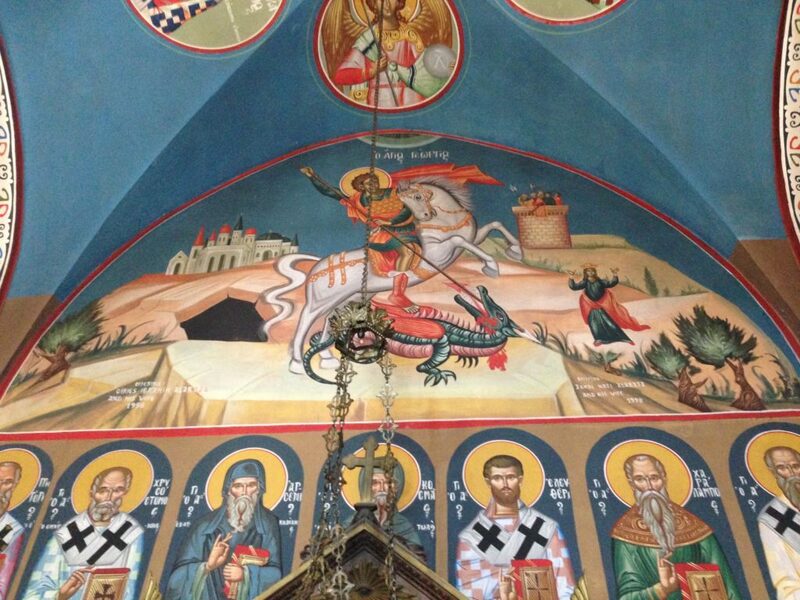 The main icon, George killing the dragon, surrounded by scenes from his martyrdom. Note the lamps in front, and the prayers and offerings behind the glass. 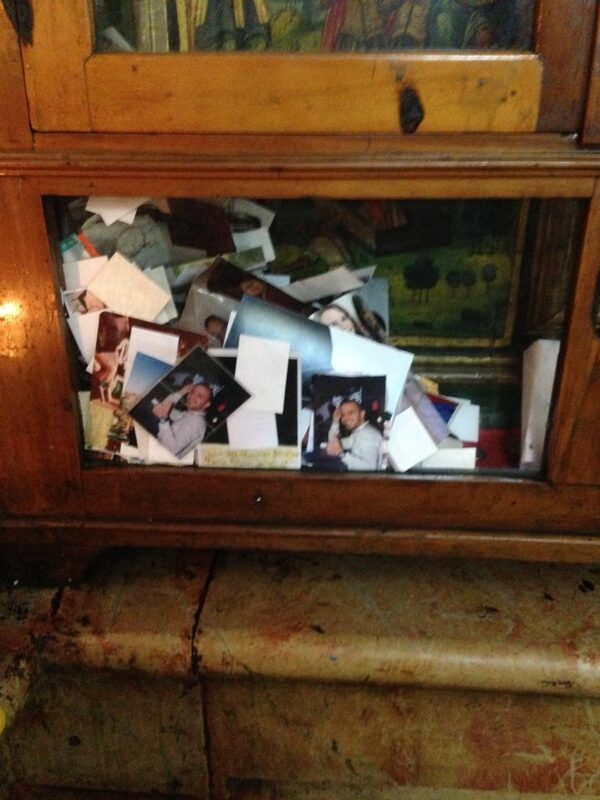 A close-up of the bottom left of the icon above: pictures of people being prayed for. 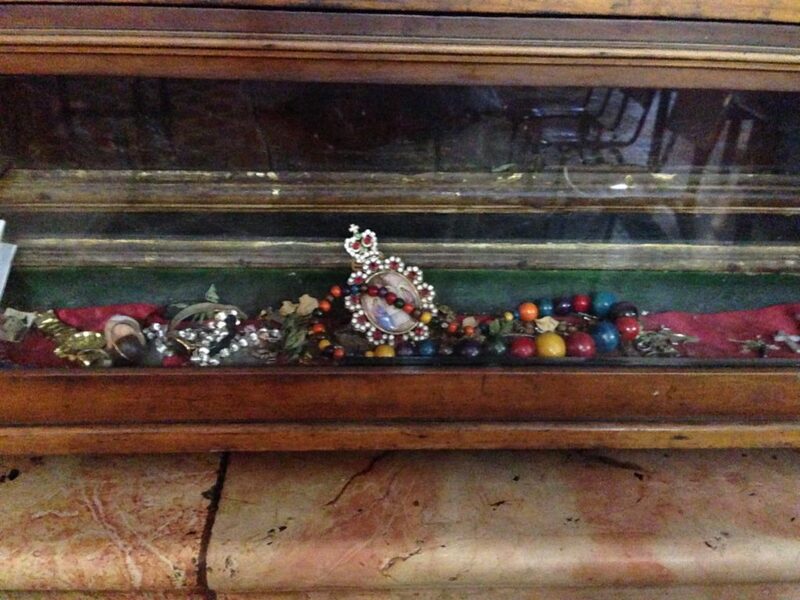 A close-up of the bottom middle of the icon above: valuables left for St. George in gratitude for prayers answered. A bank of St. George icons. A twinned portrait of Saints George and Demetrius. I’m not exactly sure whom Demetrius is supposed to be killing. 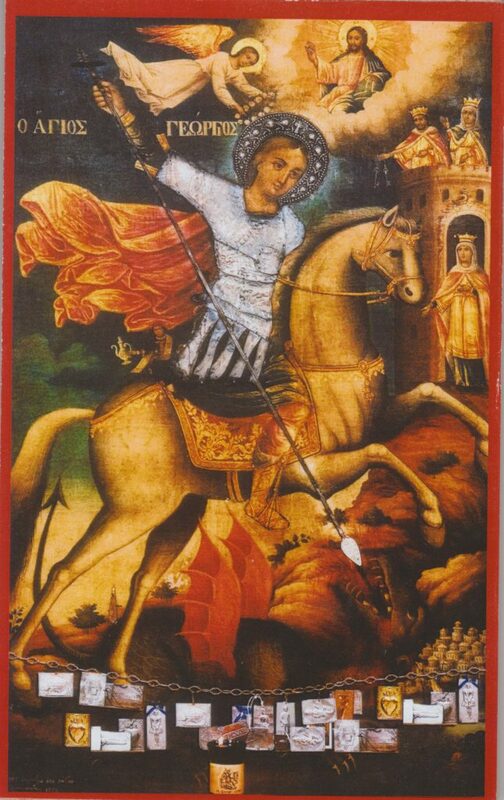 Saint George the soldier-saint, with armor, lance, shield – and bow and quiverful of arrows, something I have never seen him depicted with before. Saints Eudocimus, Sergius, Keladion, and George. An inventive depiction of the various tortures, and martyrdom, of St. George. Elsewhere, one final depiction of St. George and the dragon. 5. 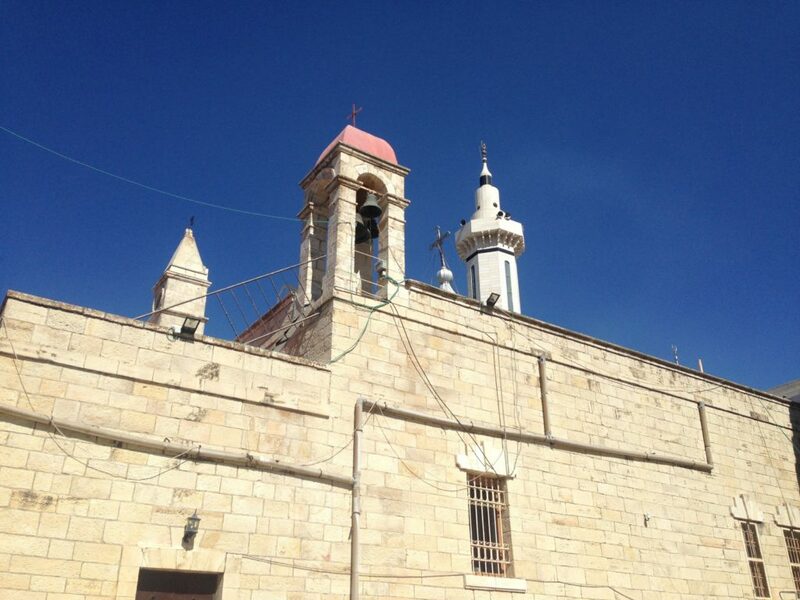 Veneration of St. George in Beit Jala and al-Khader. 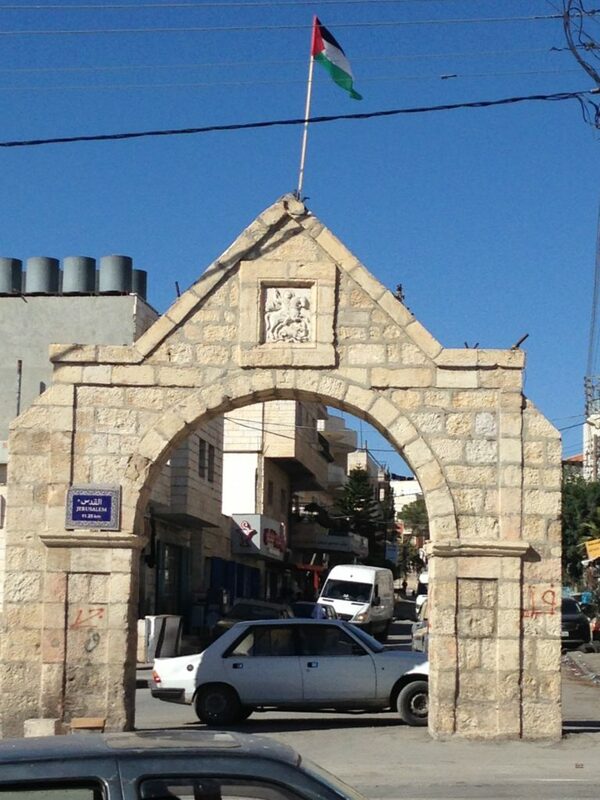 An arch in al-Khader, with St. George and Palestinian flag. Close-up of the carving on the arch. 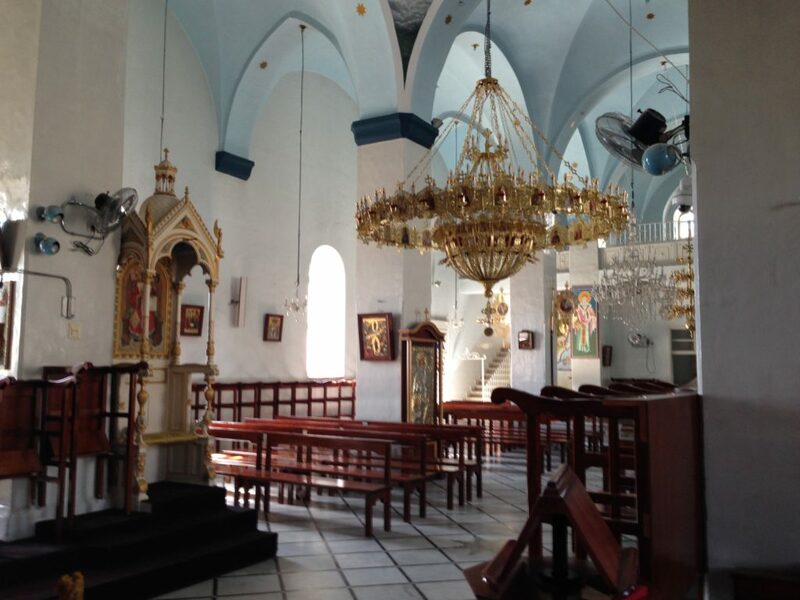 Interior of St. Nicholas’s Greek Orthodox Church, Beit Jala, Palestinian Territories. 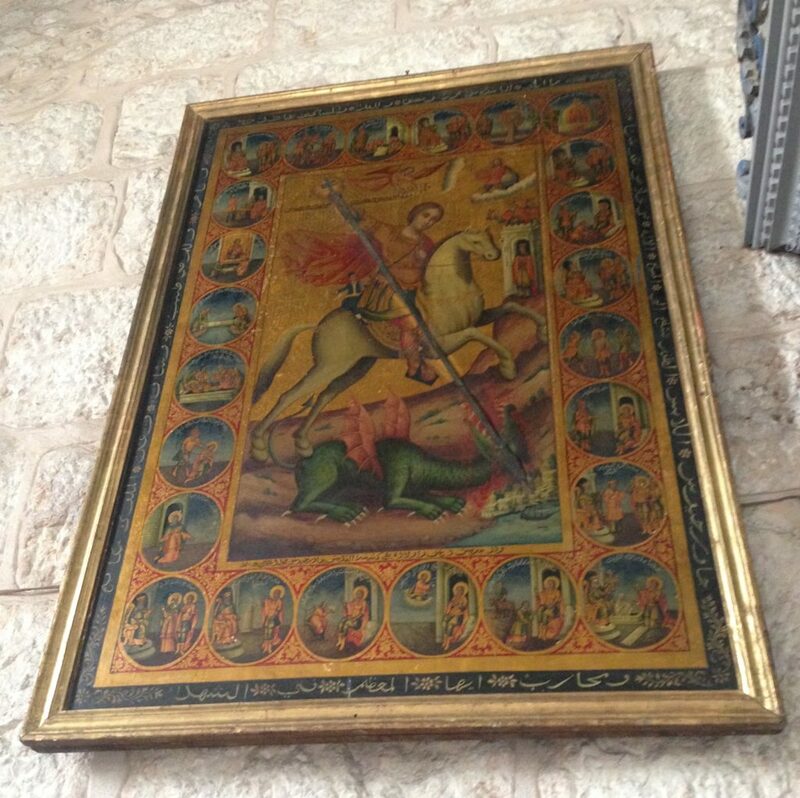 Icon of St. George in St. Nicholas’s Church, Beit Jala. 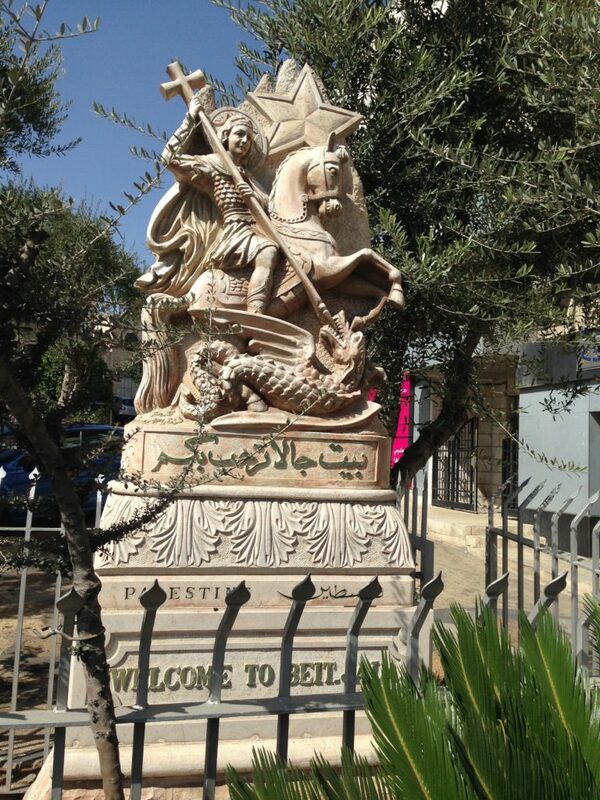 Statue of St. George and the dragon welcoming visitors to Beit Jala. 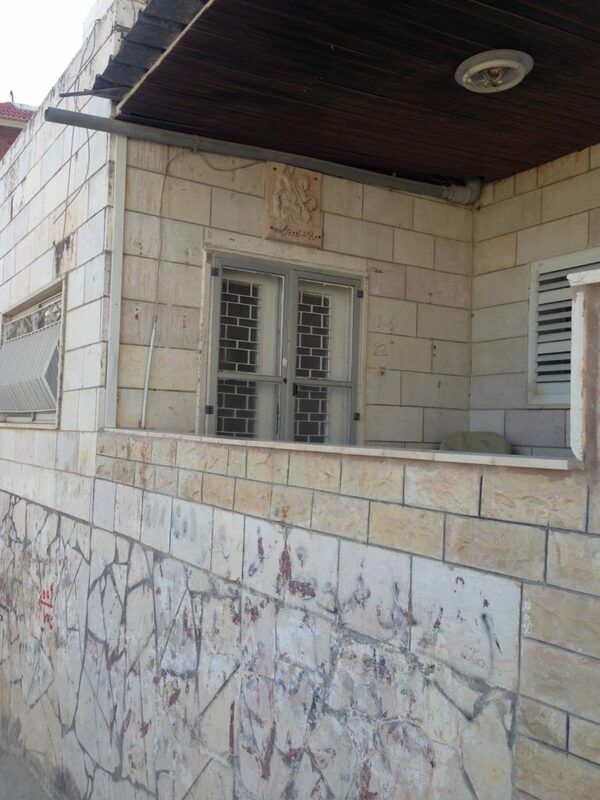 Roundel of St. George on a house in Beit Jala. 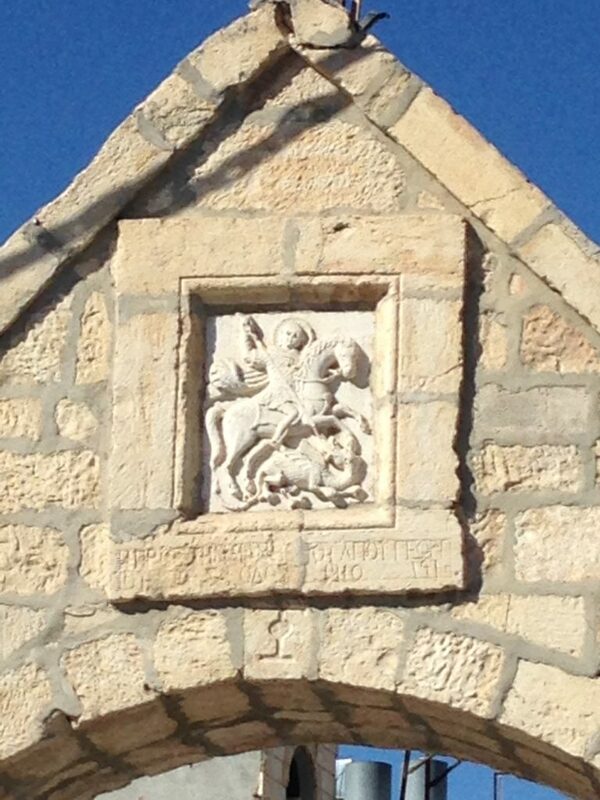 Plaque of St. George on a house in Beit Jala. 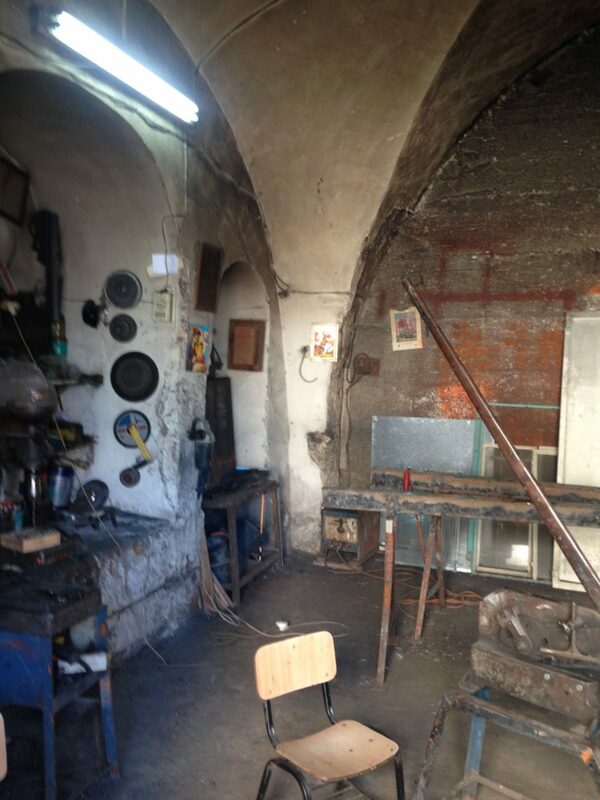 Icon of St. George in a workshop in Beit Jala. 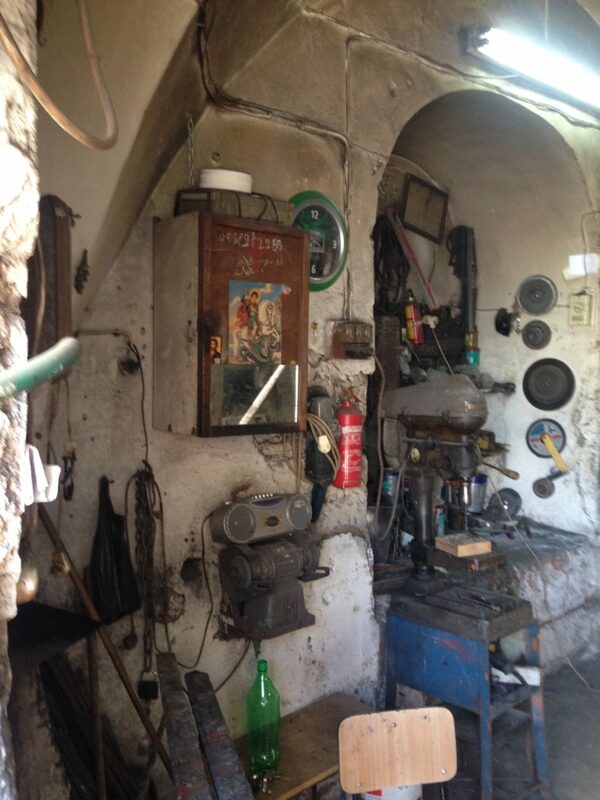 Icons of St. George in a workshop in Beit Jala. 6. 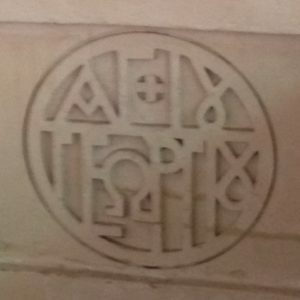 From St. George’s Greek Orthodox Church, Lod (Lydda), Israel. 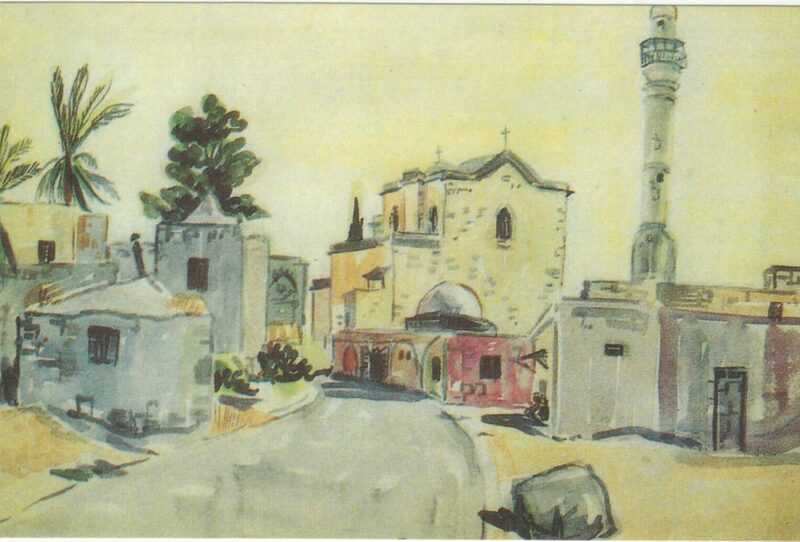 Postcard of a watercolor painting showing the church of St. George. The monastery (obscured) is across the street. The El-Umari mosque is in the foreground on the right. A photograph of the other side of the street, showing the monastery. Note the flags of Greece and of the Greek Orthodox Patriarchate of Jerusalem (a red cross of St. George with the tau-phi device on it). The door to the church. Immediately to the right of the door as one enters, a bank of candles that pilgrims can light. 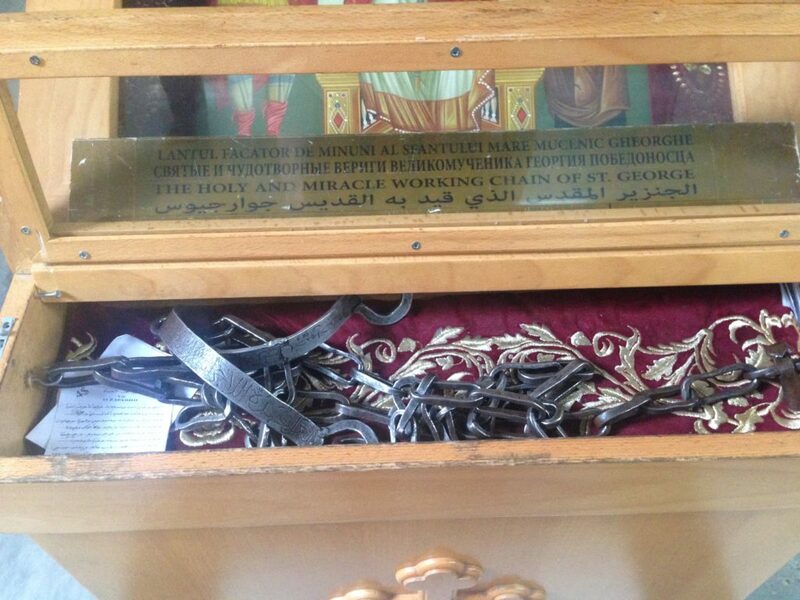 …and “The Holy and Miracle Working Chain of St. George,” which you can pull out and wrap yourself in. A pilgrim tries on the chain. Near the chain stand (you can see it on the left in this photo), a carved wooden stand for a silver icon of St. George, with suspended lamp. A scanned postcard of the icon above. To the right of the chain stand as you face it, the main iconostasis of the church. 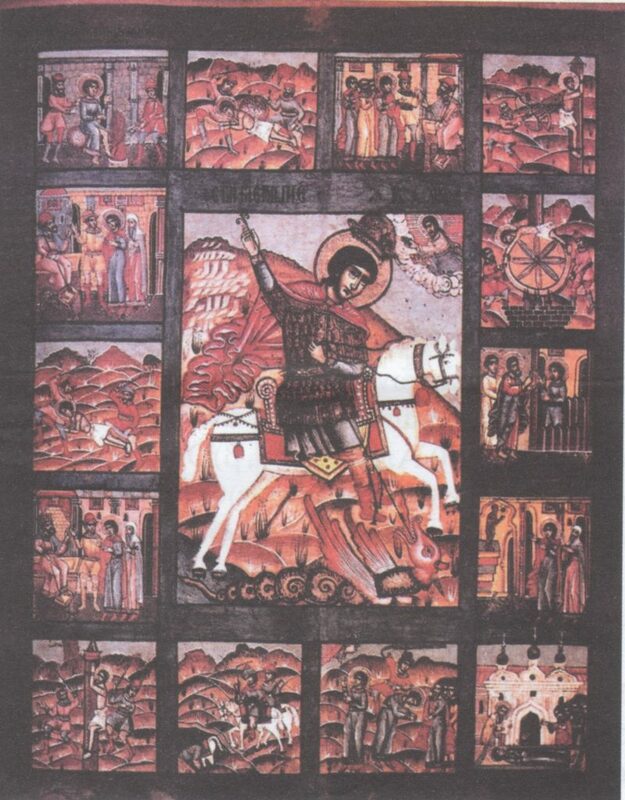 A scanned postcard of the second icon from the left in the iconostasis, showing all the details of the dragon-slaying legend: Jesus is blessing St. George, while an angel crowns him, and the pitcher-bearer rides in his saddle. The princess, her parents (her father holds out the keys to the city in an act of surrendering to the saint), their castle, and other buildings of the city (bottom right) flesh out the picture. 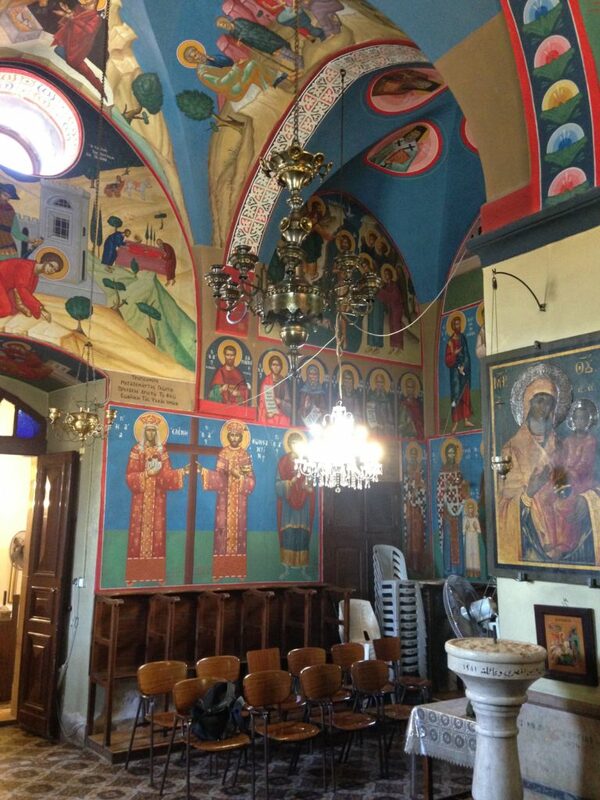 This image also shows a collection of votive offerings to St. George (these were no longer on the icon when I saw it). 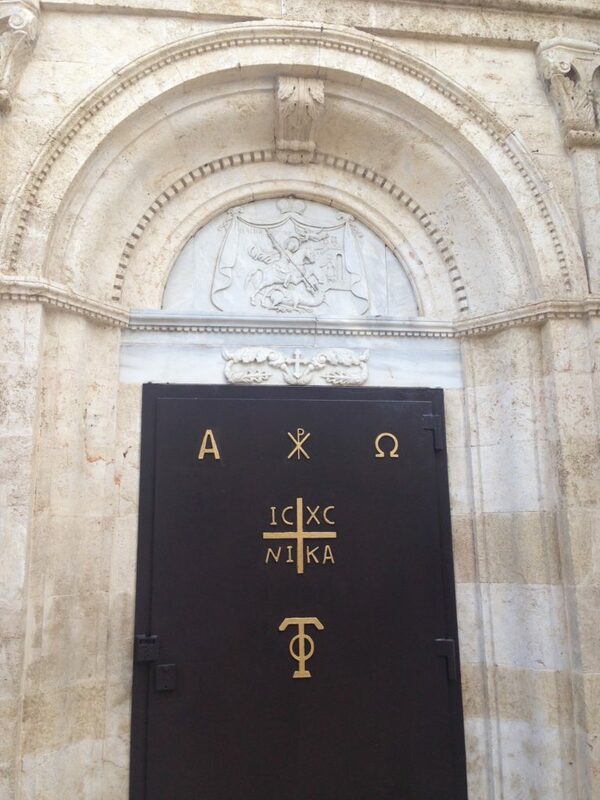 Backing up from the iconostasis, and just to the right of the silver icon, we find one of the entrances to the crypt. 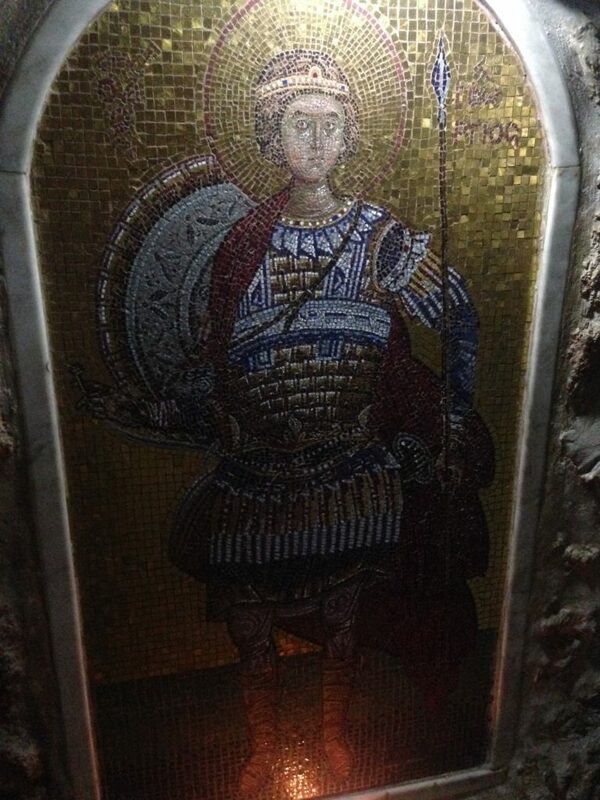 A close-up of the mosaic in the crypt, showing St. George in his original aspect as a young, beardless soldier with armor, spear, and shield. To return to the main nave, in front of the iconostasis, we find this stand, featuring a cabinet containing a blanket, a silver icon containing two relics on either side of a standing St. George, a color icon (reproduced below), and a chalice containing a candle and holy oil. A priest imposes holy oil on a pilgrim. A picture of St. George and the dragon, framed by numerous scenes from his passion and martyrdom. Another image of St. George and the numerous tortures he endured, scanned from a pamphlet in the church. 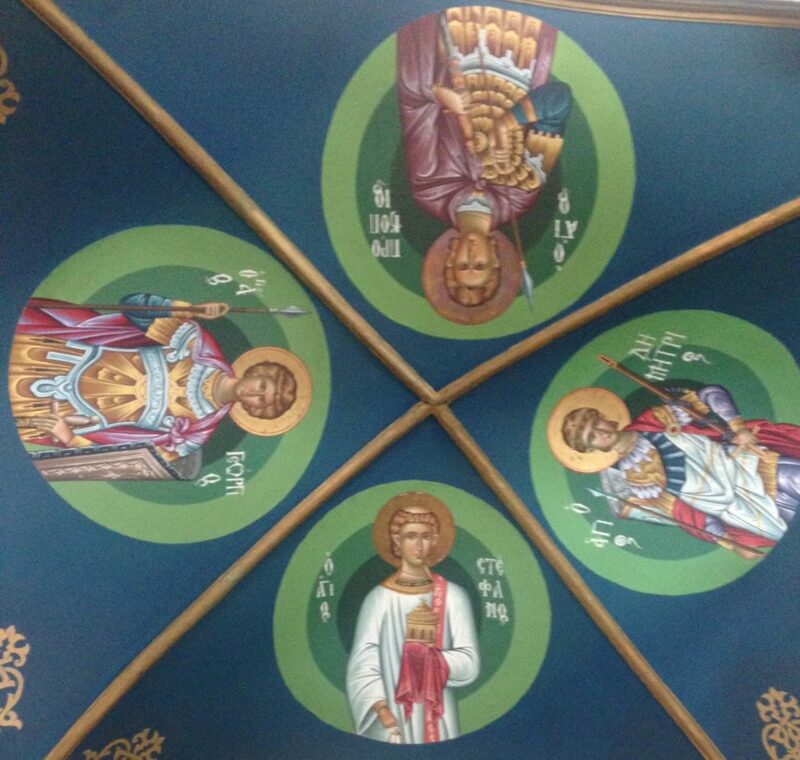 Four roundels painted on the ceiling, of Saints Procopius, Demetrius, Stephen, and George. 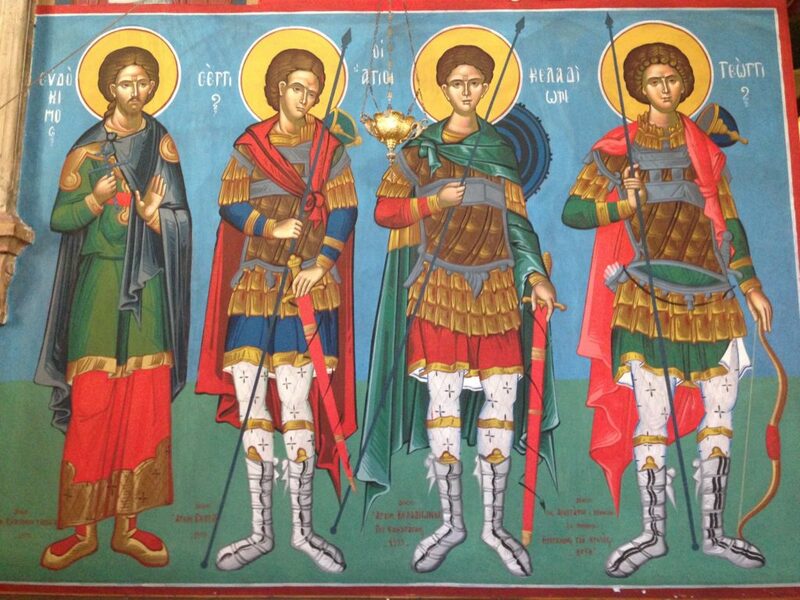 The three warrior saints are dressed as soldiers. A recently-placed mosaic of St. George, indebted to western iconography, especially with respect to the plate armor and helmet plume. Finally, a gentle reminder of the Mandatory period. My thanks to Alex Nikas for his comments. 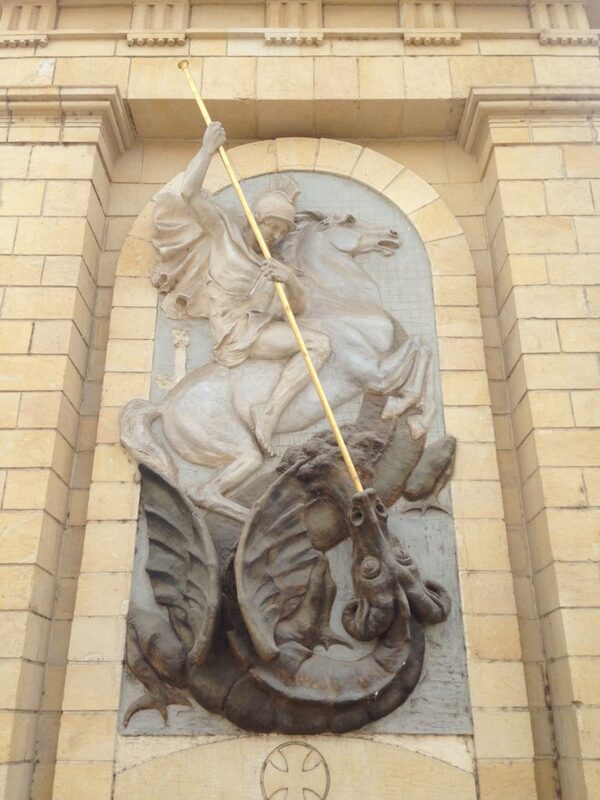 This entry was posted in Christianity, Egypt, Islam, Israel, Religion, St. George, Travels, Turkey by jgood. Bookmark the permalink.